The Otterhound dog breed is faithful, reliable, sweet, and bold. They are very good with children. They do well with the cats and dogs in the family but do chase other small animals. They are loving and friendly. Otterhounds are very cheerful and jolly. They are friendly, intelligent, but are difficult to train. Being so friendly with people, including strangers, the Otterhound does not do well as a guard or watchdog. They become alert if they listen a slight sound. 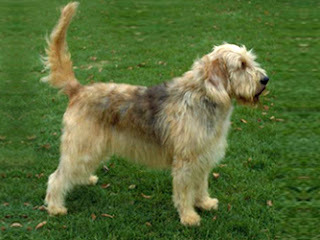 The Otterhound has a long double coat. The outer coat of this breed should be dense, coarse, rough and crisp giving a shaggy appearance, while the undercoat should be soft and woolly. Being very willful and independent, variety, consistency, and patience is the key with this friendly dog. They need a long yard. They require exercise and love to swim. A long walk is best with the master for them. Weekly brushing is enough for them. Beard must be washed frequently to prevent caking and debris.